This was when I was in the 1st Grade!!! Can you find me?? 5th from the left on the first row. The shirt was designed by my Uncle Henry..who is an artist in northern Ohio. Front row, center, gray t-shirt? you would be thinkin' correctly! So now I'm thinking either the 4th or 5th from the left...? 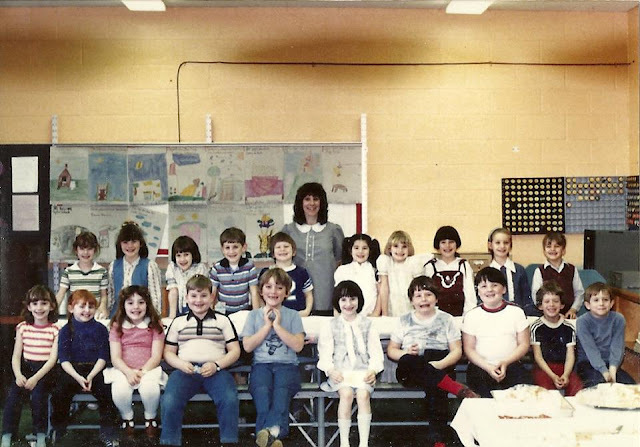 I think you are 3rd from the right in the 1st row, in the white T-shirt ith the red around the neck, but the hair is pretty dark so I'm not positive. Another guess: 5th from the left, front row. Those hands under your chin seem like something I've seen in another photo of you - it just seems like a pose that is 'you'. Am I right this time? I think 5th from the left on the front row with the hands clasp in front. Enthusiasm reminds me of your blog pic!